Summary: If you are looking for a book chapter that will help you think through content area reading and writing beyond taking tests and basic writing, read this. Facilitators planning and/or framing the thinking of a group that includes content and literacy specialists will appreciate how the authors propose powerful common “aims” for adolescents’ content area learning and offer specific examples to illustrate their thinking. We believe that change begins with imagination. Just as the composition of a poem begins with the imagination of the author, change in classroom instruction must begin with the imagination of teachers. Indeed, we worry that the rush to implement changes in classrooms will remain hindered if educators do not allocate sufficient time and space to imagine. Therefore, our position is that content-area teachers and literacy specialists must initiate reform efforts by first taking time to imagine together. Our confidence in collaboration and imagination stems from our own participation in collaborative activities over the past 5 years. During this time the authors of this book have met frequently to discuss literacy and content instruction and to (re)imagine instruction for content-area classrooms. We, like other educators, have taken advantage of the imagination of others who have described the nature of literacy instruction for content-area classrooms (e.g., Carnegie Council on Advancing Adolescent Literacy, 2010; Cope & Kalantzis, 2000). However, we describe our work as (re)imagining because we have rethought or (re)imagined what has been written about content-area literacy instruction. 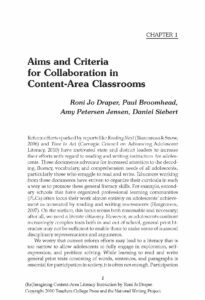 We believe that a (re)imagining of content-area literacy instruction is essential to meet adolescents’ literacy needs. Generally, descriptions of content-area literacy either have focused narrowly on traditional print texts (which may be only tangentially related to the discipline) or have suggested interaction with particular disciplinary texts that is not consistent with the way in which disciplinary experts would read or write the texts (see Siebert & Draper, 2008, for a more in-depth discussion of this criticism as it relates to mathematics). Consequently, the instruction described in much of the literature surrounding content-area literacy leads simply to a general form of literacy that is meaningful and applicable only while one is engaged in the activity of “doing school.” This general school literacy may be useful neither within the various disciplines nor in adolescents’ lives outside of school. Therefore, we have worked to (re)imagine content-area literacy so that it truly would prepare adolescents to negotiate and create texts central to the disciplines and enable them to address the problems they confront in their roles as citizens of various communities. This book represents both our attempt to (re)imagine together and our desire to encourage others to do the same.